Best Regional Distributor/ Reseller award for 10 consecutive years by Compaq Computers , USA (presently HP India) starting from 1994 to 2003 in providing IT services. Best CFS Custodian Award Presented to us by the Customs Division, Cuddalore, for 2006. "Top CFS of the year" award from DP World, 2008, for our best performance inside the Port. 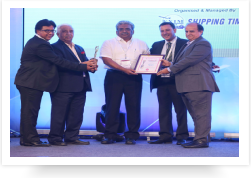 Maritime and Logistics Award 2008 - handed over by the Chairman, Chennai Port Trust. Top CFS 2011 - EXIM Achievement Award presented by the TAMIL CHAMBER OF COMMERCE. Life Time Achievement Award presented to our Chairman Mr. S. Santhanam, on the occasion of the 3RD SOUTH EAST CEO CONCLAVE & AWARDS 2011 - presented by the Chairman, Visakhapatnam Port Trust and Ex-Chairman, Mormugao Port Trust.